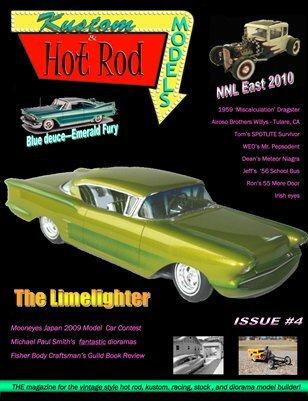 Here's issue #4 of Kustom & Hot Rod Models magazine for all you kool kats that have been diggin' all the vintage style model cars in it. We've got tons of models in this one including a 7 page special feature on world renowned Michael Paul Smiths kool dioramas and a centerspread on Steve Milberry's rad model of Bill Cushenbery's Limelighter! Also, several pages of kool models from NNL East and more! So, if you are one hep kat, you better latch your greasy paws onto this issue. Show it to your pals as they'll probably want to get their own copy. Look for issue #5 before the end of August.